China Residencies spoke with designer 趙宛青 Zhao Wanqing and photographer 歐家成 Ou Chiacheng about their project, Made in Taiwan, created during their 2015 Crystal Ruth Bell Residency for Duos, Trios & Collectives at Red Gate Residency. China Residencies: Let’s start with some introductions. How did you two meet? Ou Chiacheng: She was one of my co-worker’s students when I was teaching. Zhao Wanqing: We met before I left China, and we worked on this project together to investigate relationships. Basically I was going to leave in three months and if we were going get into into a romantic relationship, he would use photography as a way to capture this relationship with an expiration date. CR: And Chiacheng, you were teaching photography then? Where did you study? OC: In Taiwan. I was a commercial photographer, then I spent a year and a half at ICP in New York. CR: Wanqing, you did your undergraduate program in Wuxi? ZW: Yes, then I went on to get my masters in London. CR: And your first zine, Extra Tissue vol.1 Poetry , was a project out of school? ZW: Yes I wanted to make it something light and fun, like its name. 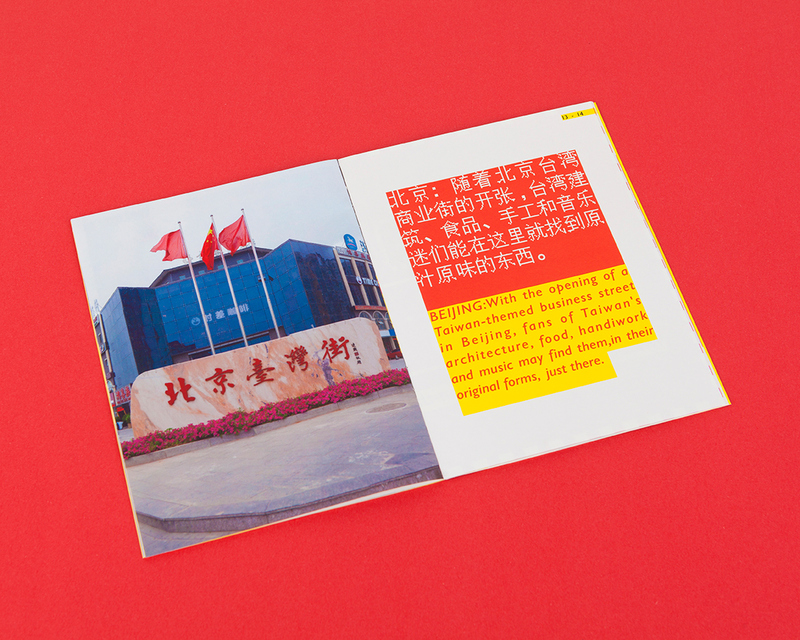 Publications related to poetry, whether in the UK or in China, all have an austere aesthetic and so I wanted to use the visual language of consumerism to break that stereotype. Not to say that one is better than other, than more traditional ways of presenting poetry, but this is how I wanted to do it. CR: How did you get interested in photography? ZW: I always was interested in publications. 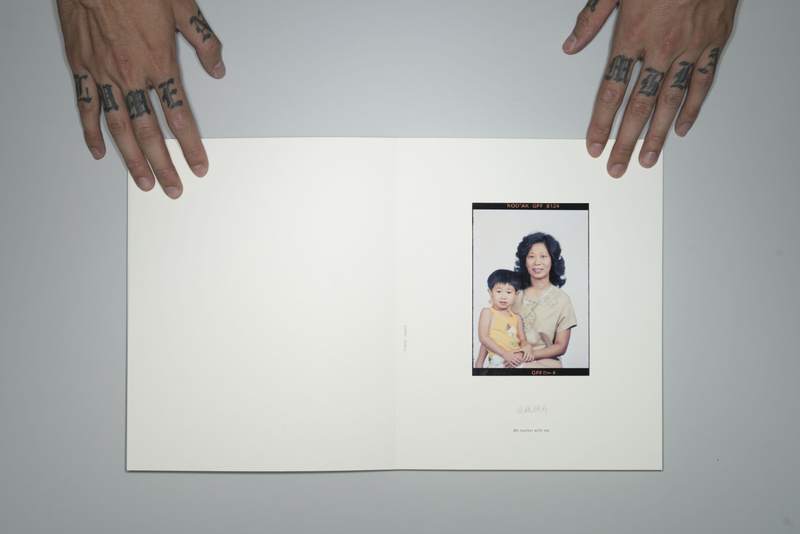 There’s an independent publishing house in China called Jia Zazhi that publishes photo books, but photography is really his domain. Even until now I can’t really say that I “totally get” photography. But he doesn’t really have an understanding of design either! CR: You’ve collaborated in the past? ZW: Yeah we’ve always collaborated. The first time was on the project Expiration, a handmade zine. 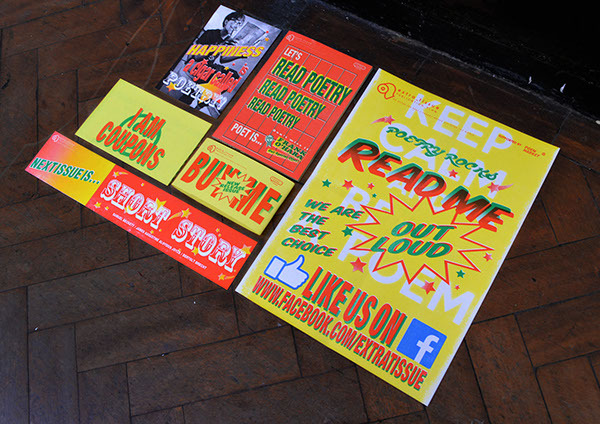 We submitted it to Printed Matter but it didn’t get selected. OC: Printed Matter donated the zines they didn’t select to SVA (even though I had wanted it to be donated to ICP), and so it’s there now at the library. CR: Did you already have the idea for your project, Made in Taiwan, or was it something you came up with for the residency? OC: I think it was the former...rather, it’s all because we met and got to know each other that we became interested in this subject matter. Actually it was Wanqing’s idea. ZW: Yeah, it all started from when we were having meals together that were often “Taiwanese influenced.” I’d get in the habit of asking Chiacheng if this stuff really existed in Taiwan. Most of the time the answer was no. It became a phenomenon that we wanted to examine more deeply. We had thought to do it in the souther part of China, in Shanghai or Wuxi, but he thought the contrast between cultures would be more apparent if we did it in Beijing. CR: And what did you think of the residency? OC: I guess we always felt busy and frantic, but we weren’t really sure for what ends? It was sort of chaotic and stressful, I felt like I had to go out and take pictures everyday. ZW: Yeah there was a lot we had to get used to, like the fact that just getting from place to place would cost us 2 hours, and we’d only get to shoot in 1-2 spots instead of 3-4...things like that. CR: Yeah, Beijing is huge! Did a month feel like enough time? ZW: I think it actually kind of worked out...of course the outcome would have been better with three months, but you also need a deadline, you can’t just keep working on it forever. OC: Yeah it really pushed us and we’re pretty happy with the result. CR: It can take an artist who is unfamiliar with Beijing or China about three months to be able to accomplish anything. The first month to figure out what’s going on, the second is spent on getting started on the project, and the last one to network a little. OC: Right, but we don’t have the language barrier. ZW: True, but I don’t think that time frame is definitely an obstacle. As long as you have it, you’ll be able to make something. CR: What did you think about the residency location in Feijiacun? OC: It was interesting because there’s nothing really like it in Taiwan. There, you don’t need to prepare to “head into town” to get something. But China’s so big. Feijiacun isn’t not so much as a village as a small town. You could buy everything you need here. ZW: At very cheap prices. I was born in Mainland China so I’m pretty used to it. I spent most of my time observing the other residents who seemed to really enjoy it here and who were so thrilled to get a chair for 8 RMB! CR: Yeah it’s kind of an in-between place... it's definitely not a metropolis, you're not really in downtown Beijing, but you're not really a farm either. OC: It’s on the urban-rural fringe. CR: Did you feel like you got the support you needed from the residency staff? ZW: Since we’re fluent we didn’t really need that much help, but Emma did come by every week to make sure we were doing okay. The team invited us to openings and we were able to meet a few Beijing artists that way. CR: So you found all the restaurants that supposedly served Taiwanese-style food on Dianping? OC: Yeah they were pretty easy to find. The hardest part was figuring out the shooting logistics. ZW: Of all the Taiwan-related things we’d found, the most amusing one was probably “Taiwan Street.” They’d found someone of political importance from Taiwan and had him inscribe the words “Taiwan Street.” The area has a lot of stuff going on but none of the restaurants actually had real Taiwanese cuisine. OC: Everything was from Hunan or Sichuan. ZW: I found some sources that state the original construction plan was to copy the style of Taiwanese streets, but the fact they ended up with something so different seems kind of insulting. CR: I found the topic of your project to be really relevant. Everyone is looking for their identity and one important step of finding it is to look at culture outside of China. ZW: We shared the zine with art critics and the topic of “cultural identity” came up a lot. It’s become a subconscious belief that things coming from outside of China are considered to be better than locally produced things. OC: Like “Lanzhou hand-pulled noodles.” You go to the grocery store with imported goods because you don’t want to buy food made in China. You’d always prefer them to be from Europe or Japan. CR: It’s kind of the same in the States, it’s only been lately that American food is starting to be considered as fine dining. What about in Taiwan? OC: There are biases for foreign products but it might not be as strong as in China. ZW: I noticed that the Taiwanese really identify with America. ZW: Yeah it seems like parents want to send their kids to the American suburbs for education. OC: Oh it might be because of the American aid during the Chinese Civil War. CR: How do you personally feel about the relationship between China and Taiwan? For example Wanqing, how would your parents react if they knew you were dating a Taiwanese guy? OC: Can we change the topic? Haha. ZW: Well I’ve been abroad a lot and met a lot of people from different places and so I don’t really have that many prejudices but my parents, or people from their generation would probably say things they’d heard in the rumor mill about “Taiwanese men not being reliable,” and things like that. CR: I think your project touches upon the idea that foreign products are more desirable than foreigners. OC: As in, you want our food and our goods, but boycott our people. ZW: That attitude isn’t just towards Taiwan but the States and Europe as well. CR: Americans also like to enjoy foreign products, but aren't always as welcoming to immigration that logically would come alongside importing products. Would you said that Taiwan feels the same way towards China? OC: Well that’s from our upbringing and being on the losing side of the war. My father’s generation says things like “one day we’ll be victorious and take back our independence.” There’s a sentiment that mainland China belongs to them. I had some of these thoughts too when I was a kid, that Communists were bad, or that the quality of life was really low. CR: Some of your earlier work was about your family background? OC: Yes, my mother’s from Tianjin and so I grew up around this kind of conflict. ZW: Like an identity crisis. CR: There’s not many opportunities for dialogue around this topic and that’s why I think your project is so interesting. How did you come up with a plan to execute your zine idea? ZW: We planned around the time but were able to find a lot of content. Most of it is food related but there were other things like KTVs and little communities. Oh and hair salons, but that one didn’t make it in. OC: Because food was so prominent we ended doing another food still life series. I think it was super important to eat the food first and then analyze it. 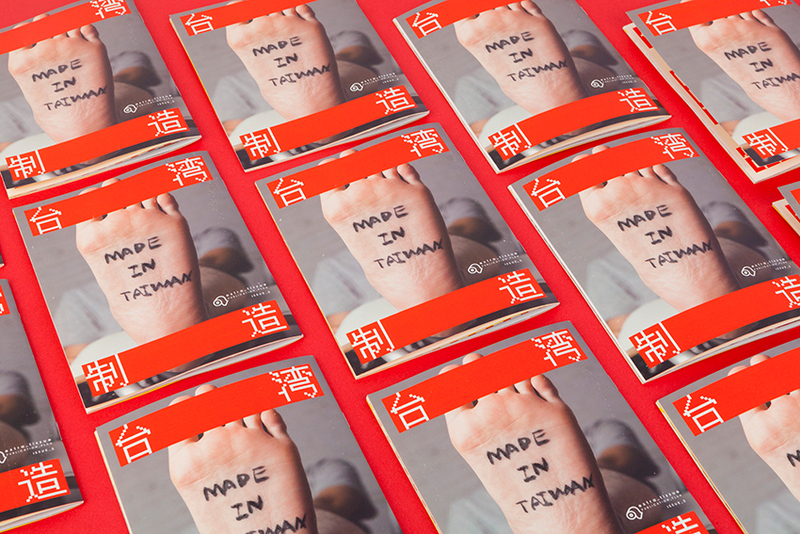 ZW: The feedback that came to us when you brought the zine back to Taiwan was interesting. OC: We hadn’t even shown the zine to the DIY publication book store yet but they said they were already getting requests to purchase it. ZW: We had assumed that the Taiwanese would be more sensitive to this topic. OC: Kind of funny but everyone in Taiwan thinks Chinese stuff has to be fake, but in China, pretty much all the Taiwanese stuff actually is fake. The store is actually kind of influential so it was a good way to get our message out there. CR: Maybe a dumb question but how did you know what was fake? OC: Just the way things are done are so different. Like this “drunken duck,” when they use beer to make the duck, is totally not done in Taiwan. ZW: Yeah like the “California Beef Noodle King U.S.A.” chain. OC: My father is Hakkanese and so whenever I saw a restaurant claiming to make Hakkanese food I would ask him, and he would always say he didn’t know about whatever they were offering. CR: The zine will be sold in Taiwan, and displayed at Photo Shanghai. I think it has many audiences: artists from Taiwan and China as well as abroad. Everyone will have a different perspective on it. OC: Yes, our project is really about a global phenomenon. I think that’s also why we chose to make it about food, because it’s so universal. ZW:We wanted the subject matter to be really accessible that anyone could form their own opinion about it. This interview was conducted in Shanghai on September 5th 2015 by Kira Simon-Kennedy, and translated from Mandarin by Fei Liu for China Residencies.